I'm not really fond of musicals. Tried watching Sweeney Todd, but couldn't sustain Johnny Depp singing about his barber blade and gave up. But this one, for Once is different. Read about it on Tushar's blog and looked appealing. The movie has a interesting background. The lead actors are artists, Glen Hansard and Marketa Irglova. 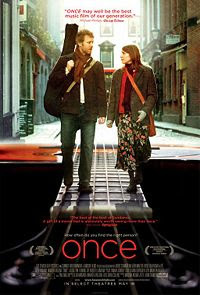 "Falling slowly", made by them, which plays through the movie many times, won the academy this year. The movie is directed by John Carney, member of The Frames band, which Glen Hansard is part of. Acts: Pretty good, I got to know that the lead actors are singers after watching the movie. Every song in the soundtrack is worthy of the musical. I've been playing the songs, all day, they just grow on you. Lyrics, mostly by Glen himself are beautiful..here's from "Say it to me now"
^ I should be stating this, 'cause the last movie I saw, I liked it, but many didn't due to high AQ!